Donald Trump doesn't deserve to be attacked. He deserves to be pitied. Donald Trump, in case you haven’t noticed, loves to say ridiculous things. Saying ridiculous things is the secret to his media success. He got famous, after all, by humiliating and firing people on national television. It’s not unusual for Trump to attack the looks of women he wishes to demean. When he wants to put a man in his place, he focuses on the man’s bank account. In 2011, he insulted Mitt Romney, of all people, by noting that Mitt Romney was basically a poor person compared to Trump. “I mean my net worth is many, many, many times Mitt Romney,” Trump said. This kind of behavior, and these kind of statements, are not the fruits of a healthy outlook on life. While many people regularly mock Trump for his outlandishness, I actually feel bad for him. I pity the desperate need for external affirmation through fame and wealth. As I wrote when Trump first announced his 2016 candidacy, I don’t think Donald Trump needs a campaign; what he needs is a hug. I legitimately feel bad for the guy. 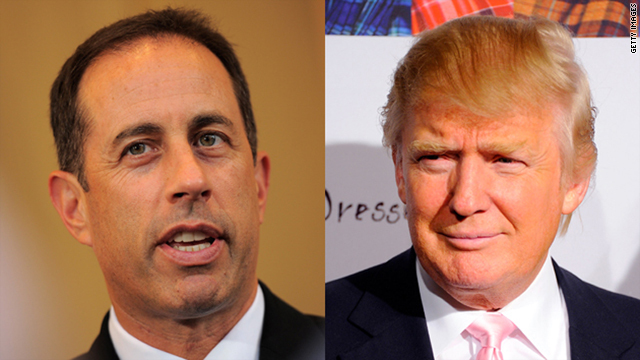 Which brings us to Jerry Seinfeld’s advice for how to handle someone like Trump. During a reddit AMA in 2014, comedian Jerry Seinfeld was asked how he handled hecklers who disrupted his sets. His answer provides a perfect blueprint on how Republican strategists, pundits, and presidential candidates should handle Donald Trump, who is basically a C-list comedy club heckler masquerading as a White House contender. Republican skeptics of Trump shouldn’t become outraged every time Trump says something absurd or ridiculous. They should be sympathetic. Republican candidates on the debate stage with Trump shouldn’t attack him, they should feel empathy for him. Don’t ridicule Trump for the kind of behavior that would never be tolerated from toddlers, let alone fully grown adults. Instead, engage him and ask him why he thinks a rich, powerful, famous man like himself feels the need to belittle the looks of a cancer survivor. As Seinfeld noted, the key to disarming an angry, insecure heckler who’s desperate for attention isn’t a quick, witty response. It’s pity.